This Wednesday, C24 Gallery and the Parrish Contemporaries Circle held their first joint event, alongside Berry Campbell. The Contemporaries Circle Gallery Hop on W 24th was a success. Invited guests started their evening with artist Susan Vecsey at her exhibition at Berry Campbell and then congregated at C24 Gallery for a private showing of Katja Loher’s solo show What is the color of Scent? Guests view the exhibition and chat with Katja Loher and Tansy Kaschak prior to their artist talk. Guests mingled with wine and tea as Loher and her collaborator for the exhibition, scent artist Tansy Kaschak, made their rounds – established collectors of Katja’s work, her collaborators, and the Parrish Contemporaries Circle were all in attendance. 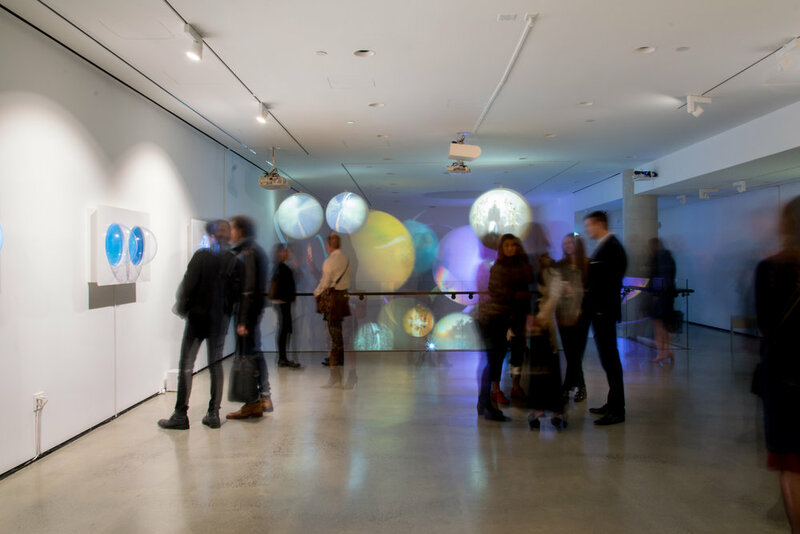 Loher and Kaschak offered insight into the thesis of the exhibition, as well as their creative process, during an artist talk that took attendees from one element of the exhibition to the next. Topics discussed included the necessity of love for all things; bees as communicators; and the spirituality of mandalas, which are heavily featured throughout What is the color of scent? thanks in large part to Loher’s recent artist residency in India. The Videoplanets of Katja Loher’s Miniverse illuminate C24’s gallery space.